FINISHED SIZE 29¾ (33½, 37¼, 41, 44¾, 48½)" chest circumference. 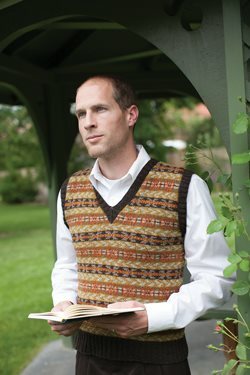 Vest shown measures 33½". YARN Brooklyn Tweed Loft (100% wool; 275 yd [251 m]/1¾ oz [50 g]): #16 pumpernickel (dark brown; MC), 2 (2, 2, 3, 3, 3) skeins; #21 hayloft (yellow; CC1), 2 (2, 2, 2, 3, 3) skeins; #06 foothills (gray-green; CC2), 1 (1, 2, 2, 2, 2) skein(s); #29 fauna (greenbrown; CC3), 1 (1, 2, 2, 2, 2) skein(s); #17 embers (orange-red; CC4), 1 (1, 2, 2, 2, 2) skein(s); #04 nest (light brown; CC5), 1 (1, 1, 1, 2, 2) skein(s). NEEDLES Body—size 2 (2.75 mm): 24" or longer circular (cir). Rib—size 1½ (2.5 mm): 24" or longer cir. Armholes and neckband—size 1½ (2.5 mm): 16" cir. Adjust needle size if necessary to obtain the correct gauge. NOTIONS Markers (m); stitch holders; removable marker; sewing thread or lightweight yarn and sewing needle for tacking trimmed steek into place; tapestry needle. GAUGE 30 sts and 40 rnds = 4" in charted patt on larger needle.